The topic is old and we are not going to reinvent the wheel. 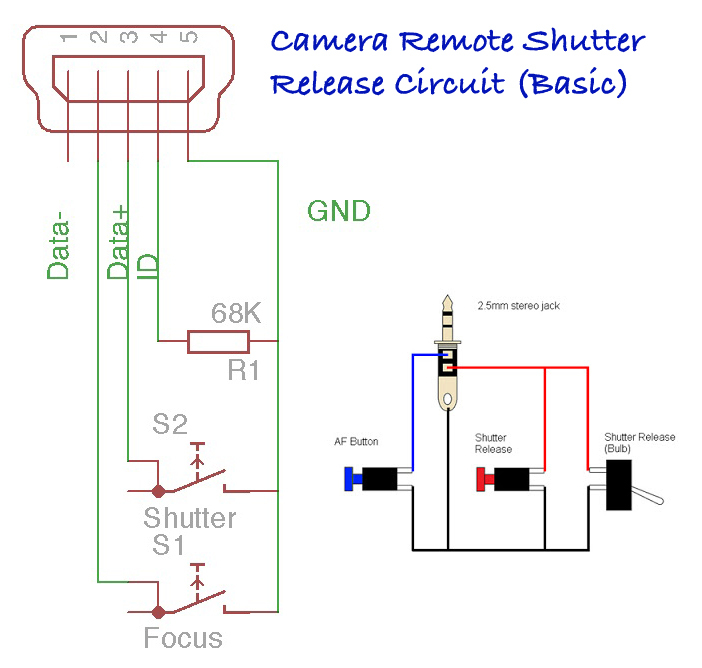 We want to introduce readers to basic camera remote shutter release circuit. Not all of the readers and camera owners are aware that we actually can build pro grade remote shutter with Arduino, Raspberry Pi and display. However, basic electronic components can build remote shutter release and for your camera model, it is most important to build the basic working model which works. Later you can add logical part with Arduino, Raspberry Pi. Most cameras are quite proprietary in nature and getting advanced data to get more features may be difficult. The basic concept to use resisters is for not damaging the circuit of camera. Factually the value of resisters depends on the brand to some extent. Usage of longer length cable may demand using battery as well. In the above case, when the remote focus button is pressed, the circuit of camera faces different resistance than fully pressed. In ideal situation, we should know the exact value of resisters of a model. 5% tolerance of resistance is acceptable. You can also use potentiometers to test the approximate value. The value of the resister(s) would the highest value of resistance at which the intended function works. Higher value of resisters not going to harm the circuit of camera. Readers should search the web for other users who are using such DIY system for their models. We will proceed to next discussion about advanced control of camera with DIY electronics. This Article Has Been Shared 5467 Times! Car Data Capturing For Newbie Guide is For Helping You to Hack Your Car OBD II And Interface Easily With Arduino, Raspberry Pi at Cheap Cost. Here Are Schematics, Parts, Circuit Diagrams, Codes For Building DIY 7 Segment LED Display Calculator (Which Includes Arduino Project). Normally We Use Through-Hole Components For DIY Electronics. SMD Takes Lesser Space. Here is a List of SMD Basic Electronic Components. Cite this article as: Abhishek Ghosh, "Camera Remote Shutter Release Circuit (Basic)," in The Customize Windows, June 2, 2017, April 21, 2019, https://thecustomizewindows.com/2017/06/camera-remote-shutter-release-circuit-basic/.